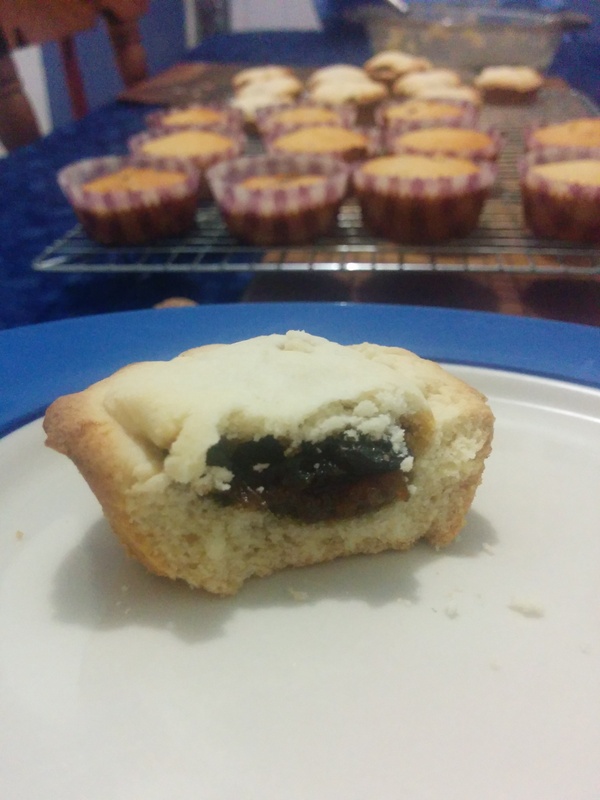 Mince pie made by Jo, photographed and eaten by Alexander Walton, 11th January 2015. Cakelings and more mince pies cooling in the background. Mince pies are a British Christmas delicacy. They exist in Canada, but not in the same profusion. There’s rather a charming superstition about them which is that for each mince pie you eat you will have a happy month in the next year — but any one person’s baking only counts once. You’d have to go around to twelve houses and be given a mince pie in each to ensure a happy year. I’m sorry to say that this doesn’t work. I don’t even like mince pies but I have tried this and really, no. But mince pies are the traditional thing to give callers in the Christmas season. You can make them with shortbread, but canonically you make them with this incredibly fiddly secret family pastry recipe. 5 ounces of SR (patisserie) flour — this is my aunt’s “five ounces or a bit more”. Use six, I always end up adding more. In a little bowl, put 2 oz icing sugar, 3 tablespoons of cold water and an egg yolk. (Save the white for cakes). Beat together until well mixed. Then use this as if it’s water to mix into the flour and make dough. Chill really well — chill for a long time. Several hours. All night. You can then roll it out, but it’s hellish to work. So what I suggest is make a big roll and a small roll, and slice them with a really sharp knife. The big roll should be the size of the bottom of your patty tin and the small one the top. How you make the roll is: put it on lots of greaseproof paper and roll it on the counter, in the paper, before you put it in the fridge. Use the slices to line the patty tin, fill with about tablespoon of mince or apple, (you don’t want them too full or they will ooze) bake for 15 mins in an oven pre-heated to 180C. You can make mincemeat for mince pies, but I never do as nobody ever complains about the stuff in jars. (I used to know which of the UK supermarket brands were vegetarian. The Co-Op one was.) Robinson’s is very traditional. Just buy a jar. If you don’t like mincemeat (as I don’t) you can have the benefit of this awesome and fussy pastry by making apple pies. Apple Sauce, or Stewed Apples Put a lump of butter in a saucepan, about an ounce. Take four or five medium sized apples, any kind, but softer and sweeter is better. Peel and quarter the apples, remove the cores. Put the quarters with the butter on a low heat. Do other stuff in the kitchen. Stir now and then. If you have a kid around, get them to stir, kids love doing this. When you stir it and you can tell with a wooden spoon that the apples are soft (or when the kid yells “The apples are soft, they’re soft, they’re soft, Jo!”) taste it and see if it is sufficiently sweet. If not, add some sugar, about an ounce. At this point you can also add cinnamon (a pinch) and nutmeg (a small pinch). If you’ve added sugar stir it well in so it dissolves, which doesn’t take long. Then take a potato masher and mash the apples. If you still have the kid around, have them do it. Kids love doing this even more. Mashing them is very easy. You then have applesauce, suitable for serving with pork or goose, or using as a filling for these pies, or both. Apple sauce scales up, you can make a ton at once with lots of apples, limited only by the size of your pan. You can also use it as the base for apple crumble (“apple crisp”) or some kinds of normal apple pie.